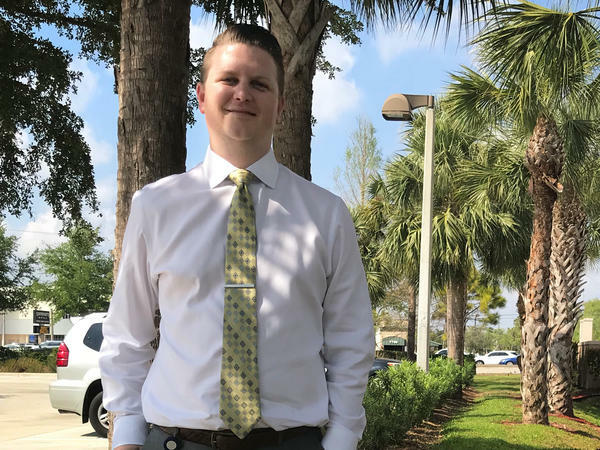 Benjamin Hynden was surprised when he received a bill for a CT scan that was 33 times higher than a scan he received a few months before at an imaging center. But three months later, in mid-January, Hynden was still feeling lousy. He called Ardesia's office again. This time the doctor wasn't available. A nurse practitioner, concerned that Hynden might be suffering from appendicitis, advised him to go to the hospital right away. "I was a little worried," Hynden recalls. "When he told me to go to the ER, I felt compelled to take his advice." Hynden arrived later that morning at Gulf Coast Medical Center, one of several hospitals owned by Lee Health in the Fort Myers, Fla., area. The triage nurse told him the problem wasn't his appendix, but she suggested he stick around for some additional tests – including another CT scan — just to be safe. It was the same kind of scanner, he said. "It was the exact same test." Total bill: $10,174.75, including $8,897 for a CT scan of the abdomen. Service provider: Gulf Coast Medical Center, owned by Lee Health, the dominant health care system in southwest Florida. Medical procedure: A CT scan, which uses X-rays to create cross-sectional images of the body. Hynden got his October scan at Summerlin Imaging Center, a stand-alone facility in Fort Myers that offers a range of diagnostic tests, including X-rays, MRI and CT scans. Rick Davis, co-owner of Summerlin, says his center is small and independent, so he doesn't have much bargaining power. That means insurance companies pretty much dictate what he can charge for a scan. In Hynden's case that was $268, including the cost of a radiologist to read the images. Ultimately, what Medicare decides to pay for a scan sets the standard. "The Medicare fee schedule is what all the other companies use as their guideline," Davis tells me as he gives me a tour of Summerlin. "It's basically the bible. It's what everyone goes by." Summerlin's office manager, Kimberly Papiska, says the maximum the center ever bills for a CT scan is $1,200. But the rates insurance companies pay are usually less than $300. Hynden was shocked when he got the second CT scan in January, and the listed price was $8,897 — 33 times what he paid for the first test. Gulf Coast Medical Center is part of his Cigna insurance plan's approved network of providers. But even with Cigna's negotiated discount, Hynden was on the hook for $3,394.49 for the scan. The additional ER costs added $261.76 more to that bill. "Generally that it is not unusual for the cost of providing a CT scan in an emergency department to be higher than in an imaging center," the statement said. "Emergency department charges reflect the high cost of maintaining the staffing, medical expertise, equipment, and infrastructure, on a 24/7-basis, necessary for any possible health care need — from a minor injury to a gunshot wound or heart attack to a mass casualty event." Do the hospital's costs and preparations justify a list price that's so much higher than the nearby imaging center's tab? We asked some experts in medical billing and management for their thoughts. 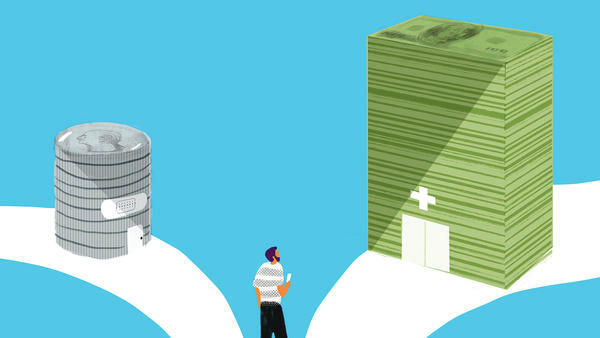 Emergency rooms often charge people with insurance a lot of money to make up for the free care they provide to uninsured patients, says Bunny Ellerin, director of the Health Care and Pharmaceutical Management program at Columbia Business School in New York. "Often those people are what they call in the lingo 'frequent flyers,' " Ellerin says. "They come back over and over again." She says hospitals also try to get as much money as they can out of private insurance companies to offset lower reimbursements from Medicare and Medicaid. Even in that context, the price of Hynden's hospital CT scan was high. Healthcare Bluebook, an online pricing tool, says the range for an abdominal CT scan with contrast, like Hynden had, in Fort Myers is between $474 and about $3,700. It pegs a fair price at $595. The higher price from Gulf Coast and its parent company could be a result of their enormous pricing power in Fort Myers, says Gerard Anderson, a professor of health policy and management at Johns Hopkins University. Lee Health owns the four major hospitals in the Fort Myers area, as well as a children's hospital and a rehabilitation hospital, according to its website. It also owns several physician practices in the area. When you drive around Fort Myers, the blue-green Lee Health logo appears on buildings everywhere. "Anybody who's in Fort Myers is going to want to get care at these hospitals. So by having a dominant position, they have great bargaining power," Anderson says. "So they can raise their rates, and they still do OK."
Anderson says his research shows hospital consolidation has been driving prices higher and higher in recent years. And because more and more people, like Hynden, have high-deductible insurance plans, they're more likely to be on the hook for huge bills. So Lee Health and other dominant hospital systems mark up most of their services on their master price lists — the list that prices a CT scan at Lee Health at $8,897. Anderson calls those lists "fairy-tale prices" because almost no one actually pays them. "Everybody who's taken a look at it agrees — including the CFO of the organization — that it's a fairy-tale thing, but it does have relevance," Anderson says. The relevance is that insurance companies usually negotiate what they'll pay at discounted rates from list prices. So from the master price of $8,897, Cigna negotiated Hynden's bill down to $5,516.14 — a discount of almost 40 percent. Then Cigna paid $2,864.08, leaving Hynden to pay the rest. "If it wasn't for that CT scan, I don't think this whole thing would have been so difficult and so blatantly obvious that they're extremely overcharging for that service," Hynden says. Resolution: Hynden never got a definitive diagnosis from the CT scans. Several weeks after his second test, however, he went to a nearby urgent care center, also run by Lee Health, and they performed an ultrasound on his abdomen. That test, which cost about $175, revealed some benign cysts that his doctor says are likely to go away on their own. The takeaway: Tests and services are almost always going to be more expensive in an emergency room or hospital setting. If your doctor suggests you go to an ER, it might be worth asking whether an imaging center, urgent care or walk-in clinic would suffice. Sources: Explanations of benefits provided by Hynden and interviews. Today, we have a tale of two medical bills - same patient, same test, but one test cost 33 times more than the other. It's our bill of the month, part of a series with Kaiser Health News in which we examine real-world medical bills and try to make sense of them if they make any sense. NPR health policy correspondent Alison Kodjak talked with our co-host Noel King about a particular bill shown us by a listener in Florida. NOEL KING, BYLINE: Hey, Alison. ALISON KODJAK, BYLINE: Hey, Noel. KING: All right, so tell us about this patient and these two very different charges. KODJAK: Yeah. So this is a young man in Florida named Ben Hynden, and he sent us this pair of bills that were really remarkable because they show how the cost of the exact same test - a CAT scan - can be just wildly different depending on where you get it. KING: And the only difference was location. KODJAK: Yeah. He got two CAT scans about three months apart, and the first cost less than $300. He had that one done at an imaging center, a place that only does things like X-rays, CAT scans, MRIs. The second one, on the other hand, cost $9,000 - just about 9,000. KING: From 300 to nine - I mean, I would laugh, but that's not funny at all. What was the different - what happened here? KODJAK: Yeah, so this one, he had done in an emergency room, which health economists will tell you is the most expensive place to get care. But even in that context, this price difference was pretty extreme. So I went down to Fort Myers. I met Hynden, and we went around to see what we could learn. BENJAMIN HYNDEN: Let's go see the hospital. KODJAK: We met up at his office, and he took me on a little tour. Our first stop was the emergency room at Gulf Coast Medical Center, where he got that really expensive CAT scan. UNIDENTIFIED PERSON #1: We're just going to take her for some bloodwork. We'll be right back. UNIDENTIFIED PERSON #2: All right. KODJAK: This hospital and pretty much all the hospitals in Fort Myers are owned by a company called Lee Health. Hynden says he ended up here after calling his doctor's office, worried about this nagging pain in his stomach. HYNDEN: I was just feeling, like, really bothered. And I was like, I kind of hope nothing's wrong. Let me just call my doctor to see, you know, what he thinks. KODJAK: But his doctor was away, and a nurse practitioner worried that Hynden could have appendicitis. But once he's at the ER, a triage nurse rules that out. HYNDEN: She goes, you're definitely not having appendicitis; you would've had a much higher fever, much more severe symptoms. KODJAK: But the nurse recommended he get some tests anyway, and one was this almost $9,000 CAT scan. Of course, at the time, Hynden had no idea it was going to cost that much. HYNDEN: I mean, for me, I was - I was just shocked. KODJAK: It turns out his insurance company had negotiated a lower price - about $5,500. And some of that was covered, but in the end, Hynden, who has a high-deductible insurance plan, is on the hook for more than $3,500. HYNDEN: Lee Health is probably not going to be very happy that I, you know, told anyone about what they charge me. HYNDEN: But I'm not happy with them. KODJAK: He's not happy because just a couple of months earlier, he had the same test right up the street. So we get back in the car, and he takes me there. Fort Myers is a sprawling suburban city. We passed an Applebee's and a Costco. HYNDEN: And then, you know, SuperTarget, and Starbucks and Moe's. KODJAK: One thing I notice is there are buildings with the blue and green Lee Health logo on them - a lot of them. In fact, Hynden's doctor works for a practice owned by Lee Health. And then we pass by an urgent care center. HYNDEN: Hey, look. It's part of Lee Health, too. What the heck? Man, you can't go anywhere without seeing Lee Health. KODJAK: Less than 10 minutes from the hospital, we pull into a little office park and stop at Summerlin Imaging Center. This one's not owned by Lee Health, and it's where Hynden got his first CAT scan. I go in, and the owner, Rick Davis, shows me around. RICK DAVIS: So anyway, this is the imaging center, and this is the control room for both CT and MRI. UNIDENTIFIED PERSON #3: Hi, how are you? KODJAK: Two women look through glass as a patient lies in an MRI machine. KODJAK: Across the way, a big, round CAT scan machine is visible through another window. Davis says his prices, like the $268 he charged Hynden for his scan, are dictated by insurance companies and Medicare. Small, independent companies like his don't have power in this market. Davis points to a pile of patient statements, and they show the reimbursements from insurance companies fell - sometimes by half - in the last few years. DAVIS: If you do not agree to take the decreases, they'll cancel your contract. So when they finally put us out of business, they can have nothing but the hospital to go to. KODJAK: And hospital care is always more expensive than outpatient care. KING: OK, so that's why a test would cost 33 times more at a hospital. KODJAK: Well, that's part of the reason. So I talked to Bunny Ellerin, and she runs this Healthcare and Pharmaceutical Management Program at Columbia Business School. And here's what she says about it. BUNNY ELLERIN: When you think about the emergency department, it's really the front door to care. They are providing 24-hour unfettered access and by law - by federal law - must treat everyone who comes in - right? - whether they have insurance or the ability to pay. KODJAK: And then there's this virtual monopoly in Fort Myers. Lee Health owns all the hospitals and also employs many of the doctors in town, so, that gives them this power to charge pretty much whatever they want. KING: Did you get to talk to Lee Health about this? What'd they say? KODJAK: Well, I tried to talk to Lee Health. No one would go on tape and talk to me for the story. But a spokeswoman sent me a long statement, and she essentially echoed what Bunny Ellerin said. She says it's expensive to run an ER, so any tests performed there are going to cost more. KING: Is the city of Fort Myers unusual in some way? KODJAK: Well, it's a specific case, but it's not that unusual. There are other cities with dominant hospital systems. And I talked to Gerard Anderson. He's a professor of health policy and management at Johns Hopkins. And he says his research shows that cities with big hospital systems and not much competition in general have much higher prices. So on Hynden's bill, the price was $8,897 for this CAT scan, and it comes from what's called a master price list. And Anderson says hospitals mark up all the prices on the list by a lot. KING: Yeah, but then do people actually pay those prices? KODJAK: Not many people do. Anderson calls them fairy-tale prices. So the higher they are, though, the worse it is for consumers because insurers negotiate down from the very high first number. And so Ben Hynden, he's still on the hook for $3,500 for this test that only cost $300 just down the road. KING: Man. NPR's Alison Kodjak, thank you. KING: You can also share your stories with us. NPR and Kaiser Health News want to see some of your medical bills, whether they're sky-high or just interesting - bills where there's a story to tell that we can then investigate. If you want to participate, go to NPR's Shots blog. You can tell us about your experiences, and you can upload your bills. There's a form. (SOUNDBITE OF AARON PARKS' "RIDDLE ME THIS") Transcript provided by NPR, Copyright NPR.